I'm OK. You're OK. (Book 1 Of 52). "I'm OK. You're OK" - was my very first book in the 52 book challenge for 2016. It was also my very first introduction to transactional analysis and to be honest, in-spite of the book being a heavy read, with a lot of theory, I enjoyed every single page of this book. If you've never come across or read about transactional analysis this book is a perfect starting point to understanding what this branch of psychology is all about. I personally found Transactional Analysis deeply interesting at different levels. I mean here is a bunch of nerds doctors referring to every interaction that happens between human beings (both verbal and non-verbal) as 'transactions' and then analyzing those 'transactions' to get deeper insights into the human mind, to build better relationships and to help individuals live a more balanced life. It's so... (for lack of a better word)... nerdy! Parent - Unlike your biological parent, the word 'parent' in TA (transaction analysis) refers to the recording you as an infant or a baby captured from your parents and grown ups around you. These recordings can range from helpful things your biological parents and grown-ups around you taught you (e.g. 'Never tell a lie'), to your parent's own belief's and prejudices (e.g. 'all politicians are corrupt') - things that your brain picked up when you were a toddler learning from your parents and grown ups all around you because you believed that 'they were ok; you were not' - the reason why you had to listen to them and learn so much from them. TA proposes that these recordings are deeply embedded in your brain and take over your interaction with others (i.e. your transactions) from time to time, throughout your life; sometimes in ways that are very subtle and even creepy. Child - Unlike your biological child, the word 'child' in TA refers to the part of your brain that is controlled by pure emotions. From that anger tantrum that you throw to that crazy hairstyle that you take up to revolt against authority, all constitutes the child taking over your transactions. The Child can be a ruckus creating personality that messes up your life, or the charming personality that attracts people towards you and sparks the fire of pure unadulterated fun! Adult - The 'adult' in TA, is the most interesting aspect of your mind. The peace maker between your parent and the child. The part of your brain that carefully and methodically examines the recordings in your parent, validates if they are right, modifies and accepts what is right and discards them if they have no relevance for you. e.g. 'Never tell a lie' is helpful because if makes you a better person but you will need to turn it to 'Don't lie unless its absolutely necessary'. On the other hand all politicians are not always corrupt and that fact was just a prejudice your dad had and will have to be tossed out. The 'adult' part of your brain does this validation and filtering. This part of your brain also has the capacity of making peace between your Parent and your Child; calming your child down and silencing your parent giving you a balanced healthy life. If your child can spark a relationship it takes an adult to keep the relationship alive for the long term. If your parent keeps you safe and unharmed it takes an adult, to calm down your parent and sometimes let your child play. You're OK, I'm not - Usually happens when you are growing up; when your parents are telling you, 'don't do that!' - the book proposes that as a child, because the child has so much to learn while growing up, and because the grown ups / parents are teaching it constantly, it's very easy for the 'child' in an infant's mind to take the position - You're OK, I'm not. I'm OK, You're Not - As the infant grows up and matures the 'adult' in the brain starts verifying every recording recorded in the 'parent' section of the brain. If most of these recordings are validated as correct, the ones that are not correct can be easily overlooked as honest, well-intentioned mistakes and discarded. But if most of these recordings turn out to be wrong, the position changes to, I'm OK You're Not. Similarly in case of abusive parents, it's very easy for the child to move to a position of I'm OK, You're Not. The book describes some of the serious dangers of this position. 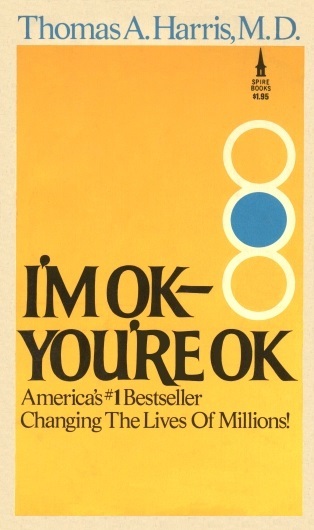 As the title suggests, the book is all about the adult part of your brain doing it's own discoveries and showcases rather interesting stories from the forefronts of psychological treatments where people slowly reach a state of mind where they are truly balanced; the - I'm OK, You're OK - stage. The stage of balanced existence where your mind is at peace with itself, with no inner conflicts and turmoil. A place where your Adult keeps your parent calm and lets your child play but in a very controlled safe environment. This book is a classic example of why I personally like books on human psychology, behavioral science and neuroscience much more that typical self help books where the author assumes a 'you can do it' tone in a peppy pitch. The book has real life case studies, explanations of studies done in the area, examples, real conversations from real therapy sessions and practical advice on how each one of us can grow a more mature 'adult' that helps create peace and balance between the parent and child in our brain. All told, It's a heavy read and you may need focused time to go through the book and take notes, but I personally highly recommend the book. There are some typos and grammar errors I picked up in the book, but the content of the book more that enough compensates for the mediocre editing. If this was an Amazon rating, I would give this book a 4 out 5 stars! All told, I highly recommend this book; especially if you are a nerd who likes to dissect and analyze data; dissecting and analyzing your 'transactions' with others can transformative! Mindful Mondays - A Daily Scrum Of Active Questions. Book 22 of 52 - The Productivity Project. Born to Run (Book 6 of 52). How We Decide (Book 4 of 52).